How do I add a minipanel to a panel page? In D7 I've created a new minipanel and would like to add it to a panel page. However, when I go to add it I cannot find it. It's not under the category I've set it in and it's not under the Mini Panels category. I've tried clearing cache, rebuilding the registry and have ensured the minipanel has a unique machine name. I found the problem: It was because the Mini Panel contained a Block that was also contained on my Panel Page. 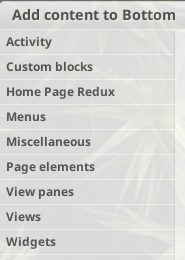 Once I removed the block on the Panel Page I was able to add it. I wish there was a way I could have the Block in both, but I guess not. Note that your mini-panel category shows up as a first order item in the list of possible entity-types available for inclusion in your panel. I expected that my mini-panels category would be a section under one of the entity-type filters and that the first order items would be permanent types, not something like a category that I created. So the first couple times I tried to find my mini-panels in the the page panel UI I also couldn't find them. In the example below, my category used for mini-panels is called "Home Page Redux." Not the answer you're looking for? Browse other questions tagged 7 panels or ask your own question. How can I assign a block to a panel or mini-panel? How to set a mini panel to display node fields? How do I get content to display using Views and Panels? How can I move custom panels content from a panel to a mini panel (using Features)? How to export Panels and Mini Panels with Features? How to add picture to every panel? How do I make a mini-panel pane a title? What could stop a component appearing on the front end? Why isn't the mini-panel I've created appearing as a panel I can add?